The drive down was quite pleasant, although I did pass through thick fog on the way. The car wash was on a fairly busy road, so I'd have plenty of people passing. I had used an older bottle of liquid latex on the wig, so when I finished my make-up, the wig was much darker. To remedy this, I had to quickly cover it in two coats of the more recent latex. This meant I took longer to get ready than I had planned. After fitting the wig, I notice that using more liquid latex, I could blend in the wig with the face and remove any signs of a join, making the effect look even better (more on the consequences of this later). After I finished the make-up, it looked amazing, and I was extremely pleased with the results, and even I found it hard to recognise myself. I also noticed I was getting much stronger reactions from the people around me working at the car wash, than I normally do; some of them were quite spooked, and they didn't like me staring at them. I'm quite used to this reaction, and to quote the famous bit of me on "Harry Hill's TV Burp" ... "when I disappear", i.e. when I stair through them, and seem not to be alive... but I was getting that reaction without consciously doing anything? There is a hypothesis used in the field of robotics called the "uncanny valley"; this hypothesis says that when human replicas look and act almost, but not perfectly, like actual human beings, it causes an uneasy response among human observers. 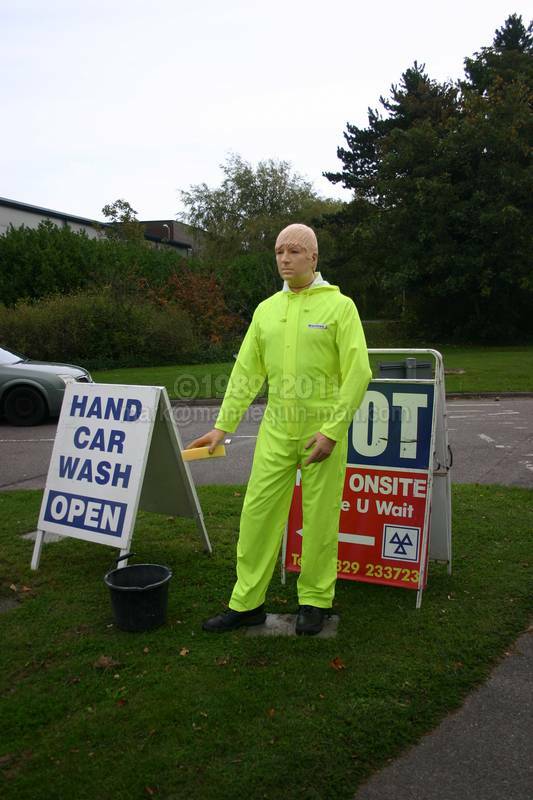 I had a couple of waterproof suits with me, which seemed an appropriate costume for a cash wash mannequin. I wanted to see which one worked best. 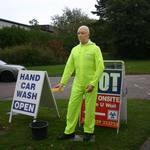 First I tried a yellow hi-vis one. Yellow hi-vis can blend into green backgrounds, which I think is why rail workers wear orange rather than yellow. I was going to be using my stand and short poles, as I was going to be standing for longer that 20 minutes, and this would allow me to stand for longer periods. I made my way to the spot I had picked out earlier (important to do this before you start), and docked with the stand, and started waving to the on coming traffic. No sooner than I had started, I noticed I was getting really good reactions, most people driving past were looking over, even if I wasn't waving, When I was waving the reaction was even better, they all looked as they drove past. What did amaze me was the number of people, young and old, who are willing to wave back, to what is to all intents and purposes, an inanimate object, al-be-it performing a human action, in a very mechanically stinted way... for all those people I turned it into a really obvious human wave and twisted round to see their reaction as they passed, which was mostly that of amazement. What I did learn rather quickly, was that constant waving was very tiring, and I had to swap hands quite regularly. It was quite fun to watch people at the bus stop, and see if they noticed that I'd switched waving hand; With some of then you could tell that they knew something was different but weren't quite sure what. After a full day's waving the time came to pack up and remove the make-up. The most difficult bit is normally removing the latex off the eyebrows. In the past, I have been a bit too keen before and lost chunks of them; so now I very carefully use hot water and soap, and ease the latex off. Unfortunately, this time, I'd done a very good job in gluing the wig on to my eyebrows, and couldn't get any warm water in, and I thought I was going to lose them for sure. Fortunately, with some patience, scissors, and warm water, the latex eventually came away, and my supercilious expression was saved.